It’s easy to trust God when you’re in control of things. In such cases, you feel secure, confident, and comforted. Of course, the problem with that kind of thinking and living is that it’s not how God calls Christians to live. Self-sufficiency is an illusionary lifestyle that puts you at odds with God–to the point where He may have to intervene into your life. God wants you to give up the desire to control your world. The need to be in control of your life is no longer a priority because you gave that right to the Lord. The biblical logic is clear: the Lord can manage things better than you can. Before Adam sinned, he had no problem relying on God. He lived with God, loved God, and was loved by God. It was a big world that he lived in and he enjoyed. And he relied on God alone. There was seemingly nothing he could not do as a God-reliant man. Then the snake walked into the Garden and fed Adam a lie through his wife, Eve (Genesis 3:1-6). The snake told Adam, in essence, he could compete with God by being a god. Adam and Eve believed the lie. How cool would it be to be a god for a day, a week, or a lifetime? That was the temptation. Adam bit, and he got what he wanted: his world was under his control. He was able to see what he could not see before, and it was his new job to run his life. Some things have not changed, have they? Today’s culture is without God. They have to figure out things. They have no choice but to “be all they can be” to survive in our big bad world. The mandate is to look out for number one, relying on yourself while using others to serve your agenda. Of course, everyone knows at some level of their hearts what Adam quickly learned: it’s all a lie. Adam could not manage the world in which he lived. Any person who chooses not to trust God has a similar fearful tension in his soul. For Adam to be self-reliant, he had to whittle his world down to something he could control. Trusting Jehovah God did not require a smaller world, but rejecting Him to become a god means you need something smaller, something you can manage. Being god was not as easy as he thought. Adam found it challenging to manage his downsized world. Though he used to walk with God in big open places, he now lived in a miniature, defiled version of what things used to be. He lived within a world of his own making. It was a microcosm inside of the macrocosm. Knowing that this was not how things ought to be, Adam’s fear motivated him to blame, justify, rationlize, and escape. These are the collective sins of controllers. Do you recognize any of these labels? Have you ever fallen prey to them? God came to Adam, asking him what he had done, and Adam did not want to be honest with God by admitting his mistake. God was calling him away from the lie, asking him to trust Him again. He even provided a means for him to do this (Genesis 3:15). God has provided you a means to do this too. His name is Jesus, the Crusher of the serpent’s head (John 3:7). Little gods, who become regenerated by God, are called to let go of their world. Becoming a Christian means relinquishing your rights to God while trusting Him in all matters. All you have to do is give up your rights and accept Him as your God (Romans 10:9). Perhaps you have done this. Maybe you have relinquished your rights to being a god and decided to live your life for the genuine and living God. Even so, you still have tension. You still live in a body that is fallen and quickly lured toward the things of this world (1 John 2:15-16). You’re daily tempted to revert to your comfort zone–being your god where you are in control. Has it ever occurred to you that maybe God sets things up in your life so you can’t control them? Have you ever wondered if God was purposely doing things to you so you would learn to stop relying on yourself? Stopping self-trust was God’s appeal to Adam. Paul taught the Corinthians how suffering leads to God-reliance. He knew their tendency because it was his tendency too. He was aware that if a person could get away with it, he would reduce his world down to something manageable to where he would never have to rely (trust) on God. Paul did not see the trouble that came to him as a negative thing, but as God’s love. He understood his sinful tendencies and how he needed prodding to break the Adamic struggle of self-reliance. Even though he despaired of life, he realized the merciful love of God, who wanted Paul to rely on Him. The sketch in this chapter is a representation of an actual drawing I drew for a couple that I was counseling. 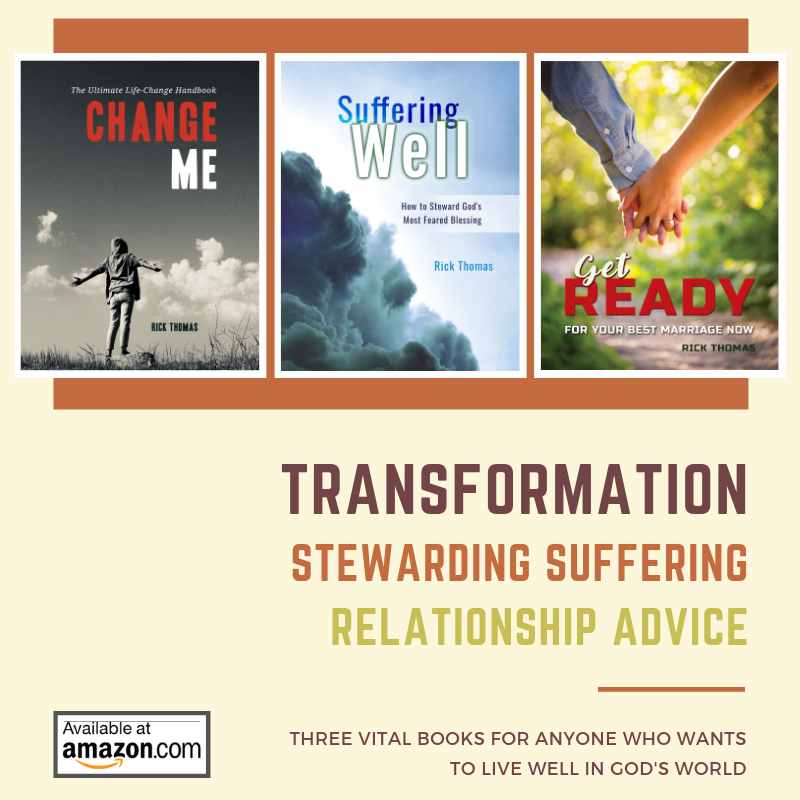 My hope was to teach them about their sinful tendencies toward self-reliance that was killing their marriage and point them to their real need–to rely on Him who raises the dead. As you see in the picture, their desire was to live within their comfort zones. Each person’s comfort zone is different, depending on their desires, cravings, preferences, dreams, hopes, or expectations. They had their hopes for a particular kind of marriage and life. As long as life was meeting their expectations and they were in control, they were okay. Things were good. The problem with this kind of thinking is it does not require authentic trust in God. It is a little god in charge of a small world. Their self-reliance is called idolatry, which is a worship disorder. God will never allow His children to live with a worship dysfunction. He demands exclusive worship, which is manifest by total trust, reliance, confidence, belief, and hope in Him alone. God will not let you get away with idolatrous thinking and practices. God is calling all former little gods (you and me) to trust the true and living God. And there is nothing beyond His means that He may choose to use to move you from self-reliance to God-reliance. God will permit or even orchestrate certain events in your life to push you out of your self-reliant comfort zone. If you don’t have this kind of God-centered perspective on suffering, like Paul, you’re going to despair of life. You will also be wrestling with the Lord (James 4:6). Typically, the initial sin of the controller is the same as the sin of Adam: it was unbelief. You and I sin similarly (Mark 9:24). When your world becomes unwieldy, your first response usually is not to trust God, and then other sins like anxiety, worry, or fear follow. You see this in the sketch. God was moving the couple out of their comfort zone, to a place they could not control, so they would learn to quit relying on themselves and trust Him who raised the dead. It would be best when things start getting out of your control to trust God. That would be a fantastic response. However, little-god-controllers typically do what they have habituated themselves into doing most of their lives: they rely on themselves. Anger–this is the most common habit for controllers. It’s a manipulative tactic for an insecure person to regain control of the world he feels he is losing. Forms of manipulative anger are anything from rage to the silent treatment, plus criticism, blaming, justification, and rationalization. Escapes–this is a dumbing down habit for controllers. Rather than dealing with the problems, he seeks to escape from the problems. Various escapes are alcohol, medication, spending money, video games, TV/movies, and overeating. It is interesting how Paul addressed the solution to the problem. He said he was being taught to trust Him who raises the dead. While you already know what the answer should be–trust God–it is instructive he would frame the solution in resurrection language. Paul used specific language to communicate the solution. He said they needed to trust the God who raises the dead. He could have said to trust Christ, believe in the cross, hope in the gospel, or any other descriptor that pointed to trusting Almighty God. He chose the resurrection as the means in which to think about God’s ability. He wanted them to know the gospel was more than a man dying on a tree. The gospel is also a man coming out of the grave. He wanted them to think about God’s powerful ability in the direst circumstances. Targeting this particular aspect of the gospel is important for you to understand. You may have a lot of capacity, competency, and ability, but you cannot bring someone out of the grave. Only God can raise the dead. What He can do for you is far superior to anything you have ever thought about doing for yourself. Yes, you can die for someone, but you cannot raise someone from the grave (Romans 5:7). Paul put God in a unique category. Now it’s up to you. Will you learn how to rely on Him? Will you repent of self-reliance? One-time repentance is not enough. You are too habituated in self-reliant thoughts and practices. You’re going to need help. One of the best things a self-reliant person could do is humble himself by letting others know about his sin and seek their help. Other-reliance is a good start that will help you overcome self-reliance.